In a world of robots and superheroes like Iron Man, you need to remember that your feet are not machines. They are living organisms in which all the various parts work together to provide a foundation for your body and propel you around. Depending on the type of feet you inherited and the kinds of pressure you subject them to, they adapt and change over time, as all living things do. Sometimes that leads to foot pain which can limit what you do each day. Fortunately, treatment with orthotics is often able to relieve your pain and restore your life to normal. What Conditions Can Orthotics Help? Achilles Tendinopathy – a collection of problems including swelling, tears, inflammation and ruptures that cause pain behind your heel and can result from overuse and tight calf muscles. Pronation and Supination – when your feet roll too far inward or outward during your gait cycle, causing painful problems with your foot structure. 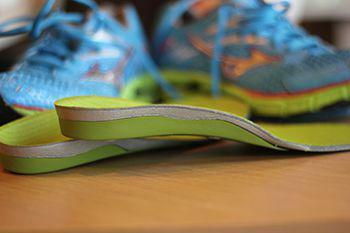 Orthotics are especially helpful for the flatfoot or high arch problems that often coincide with pronation issues. Bunions – a misalignment that forms because of inherited foot types and overpronation and causes the big toe joint to bump out on the side of your foot. Plantar Fasciitis – an inflammation and degeneration of the ligament on the bottom of your foot that can cause severe pain under your arch and heel. Heel Spurs – as your plantar fascia pulls on the heel bone where it is attached, the bone forms a calcified projection to compensate for the pressure which can irritate surrounding tissue. Metatarsalgia – refers to pain forefoot area as a result of pressure on the metatarsal heads where your toe and foot bones join. Morton’s Neuroma – this is a swelling and benign growth of a nerve between your toe joints (often the third and fourth) that can cause sharp pain, numbness, and tingling in your forefoot and toes. Sesamoiditis – inflammation of the tissues around the big toe joint as a result of damage to the two small sesamoid bones located under the joint. Other conditions helped by custom foot orthotics include runner’s knee, iliotibial band syndrome, tarsal tunnel syndrome, shin splints, degeneration caused by rheumatoid arthritis, and diabetic ulcers. The main types of custom shoe inserts can be functional or accommodative. The functional type deal with biomechanical abnormalities by redistributing weight away from pressure points and correcting gait issues that cause your bones to move out of alignment. Accommodative styles offer extra cushioning for painful areas. There are various types of shoe inserts and pads available in pharmacies and supermarkets, too, but for the best results, visit Rocky Mountain Foot & Ankle Center and let us design a custom orthotic to address your specific foot shape and the condition that is giving you pain. While we stay up-to-date with new technology and treatments, there are times when the old-fashioned way is best. Computer generated inserts are quicker, but they don’t always allow us to address a specific problem such as forefoot supinatus, a soft tissue problem in your forefoot caused by years of overpronation and muscle contractions. That’s why we still use the old-fashioned plaster mold. We are super picky about our orthotics, and want to make sure we construct them in the way that best helps your feet. Call our office in Wheat Ridge or Golden, CO, today at (303) 423-2520 and set up an appointment so we can diagnose what is causing your foot pain and whether custom foot supports are the answer. You can also schedule one using our website.